This event has been postponed until the 2018-2018 academic year. JagHunt is a puzzle scavenger hunt to be held on the campus of the University of South Alabama. Each day of the hunt, teams will receive clues to two locations around campus. By visiting each location and checking in using their phone’s GPS and the ClueKeeper app, a puzzle will be unlocked. 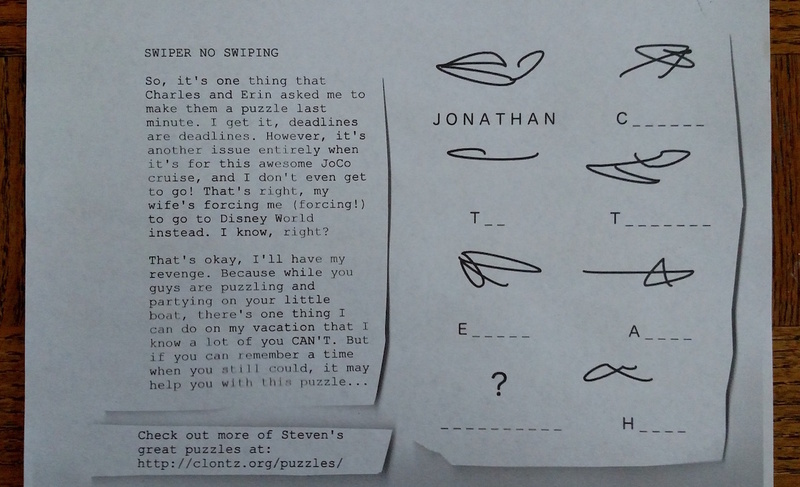 Each puzzle solves to a message that should be submitted in clueKeeper. On the final day, teams will also be challenged by a “metapuzzle” that can be solved by combining the answers to all the previous puzzles. Oh man, do I need to be a math major to solve these puzzles? NO! These puzzles are designed to be enjoyed by a general audience, and we promise none of them require anything like calculus. Players who enjoy wordplay puzzles like crosswords or logic puzzles like Sudoku will likely enjoy this event. But math enthusiasts will likely find interesting ways to apply their problem-solving skills in this event as well. A hint system will be available as well, so don’t worry about getting stuck! Participation is open to teams of three to six University of South Alabama students. Student organizations are highly encouraged to sponsor one or more teams. Each team will need at least one member with a smartphone (iOS/Android) that has the free ClueKeeper app and GPS. Each team is asked to make a small donation of $15 to the Mathematics and Statistics Club, which will be used to support future club events open to all South students. Student organizations sponsoring two or more teams are only asked to donate $10 per team. Can I see a sample puzzle? Sure! This puzzle was designed by Dr. Clontz (math club advisor) for a puzzlehunt ran on the 2016 JoCo Cruise. What word belongs under the question mark? If you need a hint: the decoding mechanism for this puzzle is almost certainly at your fingertips. How do I register? Who can answer my other questions? Details on registration and contact information will be provided in early spring. Contact Mathematics and Statistics Club president Bryant Baldwin with questions.